Last week, the National Agricultural Statistics Service (NASS) of the USDA released the 2017 Census of Agriculture. The Census is conducted every five years, and provides national, state, and county-level agricultural data that informs many federal farm programs, policies, and funding decisions. Maine’s Census Report contains some very alarming facts about the loss of farmland and farms in our state, although there is some more positive news about farmer demographics, local food sales, and organic agriculture. According to the 2017 Census, Maine has lost a significant amount of farmland in the last five years. In 2012, Maine had 1,454,104 acres in farmland, but by 2017 that number had dropped to 1,307,566 acres – a loss of 146,491 acres or 10% of Maine’s farmland. In fact, according to American Farmland Trust, Maine was in the top five states with declines in farmland between 2012 and 2017. Our losses in farmland were coupled with an equally troubling loss of farms. Maine has lost 573 farms since the Census was last conducted, going from 8,173 farms in 2012 to 7600 farms in 2017. Farms disappeared in every size category except for small farms (1 to 9 acres), which went from 1,239 farms in 2012 to 1,427 farms in 2017, and the largest farms (2,000 acres or more), which went from 55 farms in 2012 to 70 farms in 2017. The new Census data also reflects the difficult economic conditions many farmers face in Maine and across the Nation. The total and average per farm market value of agricultural products both decreased during the last five years. The total market value went from $763,062,000 in 2012 to $666,962,000 in 2017 (a decline of 12.6%), while the average per farm market value of agricultural products decreased from $93,364 in 2012 to $87,758 in 2017 (a decline of 6%). In addition, farmers in Maine lost income over this period. Average net income per farm decreased from $20,141 in 2012 to $16,958 in 2017 (a decline of 15.8%), and average net income for producers declined from $19,953 in 2012 to $16,894 in 2017 (a decline of 15.3%). Interestingly, total farm production expenses decreased from $645,631,100 in 2012 to $586,564,000 in 2017 (a decrease of 9%, which could be explained in part by the number of farms that were lost), and average production expenses decreased slightly from $78,996 in 2012 to $77,179 in 2017 (a decrease of 2.3%). The numbers are clear — now’s the time to step up and support a future for farming in Maine. It’s not all bad news. There are some positive trends identified by the Census, including farmer demographic statistics. The 2017 Census made some significant changes to the way it collected demographic data to better represent the individuals making decisions about a farming operation. As such, the Census collected information on up to four producers per farm. This change not only provides us more robust demographic data on producers, but it also counts more farmers in Maine. Here are some of the most significant demographic changes, although it is important to note that some of these changes could just reflect the change in data collection processes. The total number of producers increased from 13,168 in 2012 to 13,414 in 2017, and the total number of principal producers increased from 8,173 in 2012 to 10,705. The total number of women producers increased from 5,398 in 2012 to 5,859 in 2017, and the total number of women principal producers increased from 2,381 in 2012 to 4,265 in 2017. The average age of a farmer in Maine did increase, going from 55.1 in 2012 to 56.5 in 2017, while the average age of a principal producer increased slightly from 57 in 2012 to 57.4 in 2017. The Census did show that there are both more younger farmers and more younger farmers involved in the management of farms in Maine, although again it is unclear the extent to which those differences reflect just the changes to data collection. The numbers of producers age 25 to 34 increased going from 1005 in 2012 to 1068 in 2017, and the number of producers age 35 to 44 increased as well, going from 1,562 in 2012 to 1,780 in 2017. The number of primary producers under age 25 increased from 62 in 2012 to 72 in 2017. The number of primary producers age 25 to 34 increased from 488 in 2012 to 731 in 2017. The number of primary producers age 35 to 44 increased from 834 in 2012 to 1400 in 2017. The number of older farmers in Maine and the number of older farmers involved in the management of farms in Maine also increased. The number of producers age 65 to 74 increased, going from 2,346 producers in 2012 to 2,977 producers in 2017. The number of farmers age 75 and older also increased, going from 920 producers in 2012 to 1,270 in 2017. The number of primary producers age 65 to 74 increased, going from 1,652 in 2012 to 2,481 in 2017. The number of primary producers age 75 and older also increased, going from 715 in 2012 to 1,105 in 2017. While the number of farmers under 44 increased by 9.6 %, the number of farmers age 65 and older increased by 30 %, signaling an urgent need for succession and retirement planning. There were some very positive trends in both local food production and organic operations. The value of food sold directly to consumers increased from $24,793,000 in 2012 to $37,868,000 in 2017 (an increase of almost 53%). In addition, $74,513,000 of food was sold locally via retail markets, institutions, and local food hubs in 2017. Total organic product sales increased significantly during the last five years, going from $36,401,000 in 2012 to $60,027,000 in 2017 (an increase of almost 65%). As a result, the average per farm organic product sales also makes a huge leap, going from $65,706 in 2012 to $108,744 (an increase of 65.5%). Despite some of these positive demographic and local and organic food production trends, the loss of farms and the loss of farmland during the last five years reflects the significant challenges facing our agriculture sector. We can help to shift these trends by protecting farmland – providing the land base to grow the agricultural economy in Maine – and providing farmers with the critical resources they need for economically viable businesses and successful succession plans. 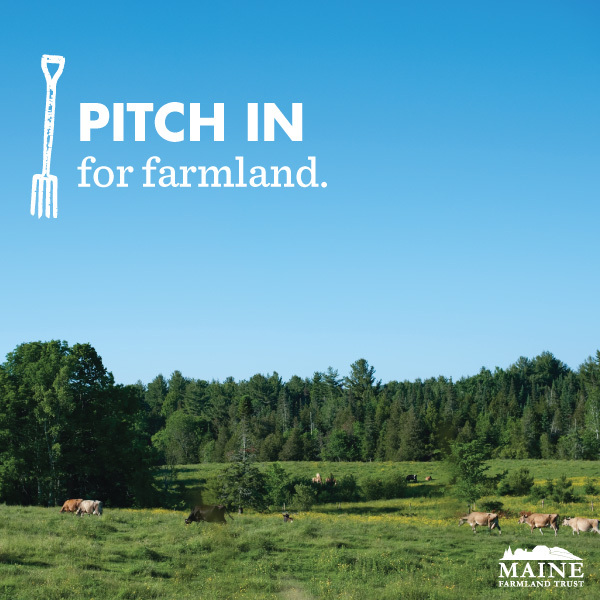 Now more than ever, we need your help to make sure Maine farms succeed. 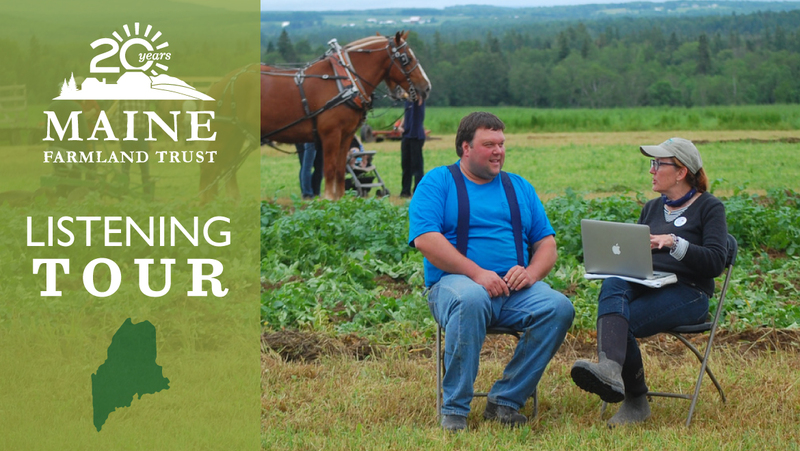 Will you step up to support a future for farming in Maine? Diversification has been critical to saving the farm. The Hanscoms are eagerly introducing agritourism and selling more “fresh pack” berries direct from their farm stand. Lisa and Wayne’s bond translates to a well-balanced business. When Lisa first suggested building tourist cabins on their land, Wayne was skeptical. When she proposed offering farm tours, he asked, “Why? Who would come?” But when a tour bus pulls in today, visitors enthusiastically pour out. And there is a further commercial side—after giving a farm tour, Lisa offers her berries and unbranded homemade jams for sale. Welch Farm’s fresh-pack yield is still small— constituting just 12,000 of the farm’s total yield of 98,000 pounds in 2015—and Wayne plans to expand it. Instead of selling all their machine-harvested berries to frozen processors for only 38 cents a pound, Welch sets aside two to three acres to “spot rake” and sell directly for $5 a quart (1.5 pounds). Due to financially-necessary waterfront land sales, Welch Farm has been whittled down to 340 acres. “I don’t want our farm to get any smaller,” Lisa stresses. Lisa has always been Wayne’s obvious heir-apparent. Young Wayne was the same way when he trailed his grandfather Frank Welch around the farm making it clear Frank could pass it down with confidence. About a decade ago, Lisa started helping Wayne run the farm full-time. She hopes their efforts will allow her to pass on a durable farm to her daughter, Alexandra. 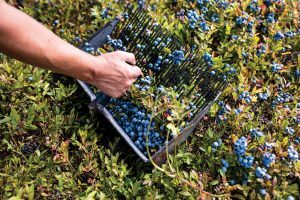 Twenty-five miles further Down East, the Beal family is sorting the certified organic wild blueberries they’ve raked since 1991 on Moon Hill Farm in Whiting. 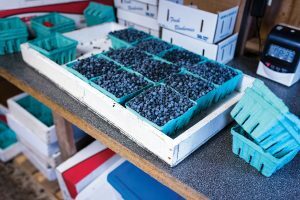 Only about 12% of Maine’s “wild” blueberries are organic, but “there’s a lot of potential” to grow this hot market through fresh sales, says University of Maine blueberry expert David Yarborough. Tim Beal also has deep roots in Washington County where his family goes back four generations. 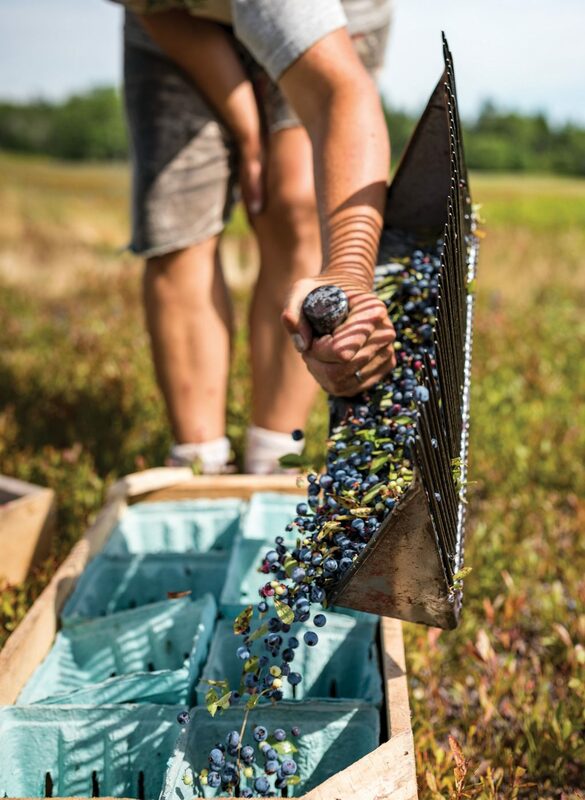 Tim started raking blueberries when he was eight; his father, a Bangor Daily News bureau chief, took the month of August off each year when he put the family to work on his ‘vacation’ project. The Beals all worked for Wyman’s alongside a crew from Nova Scotia’s Mi’kmaq people. As they all toiled on the fruit, Tim’s dad assiduously reported on the blueberry business beat. 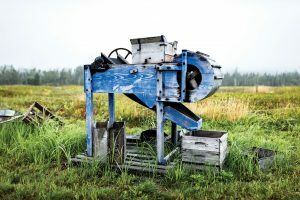 In the early 1980s, he broke stories on the first mechanical pickers, as well as the wild blueberry industry’s transition from organic practices to its widespread embrace of pesticides to control the dreaded maggot fly. Tim’s California-born wife, Lydia, met her husband at the University of Maine at Machias. As a young couple, they chose to homestead in Washington County. 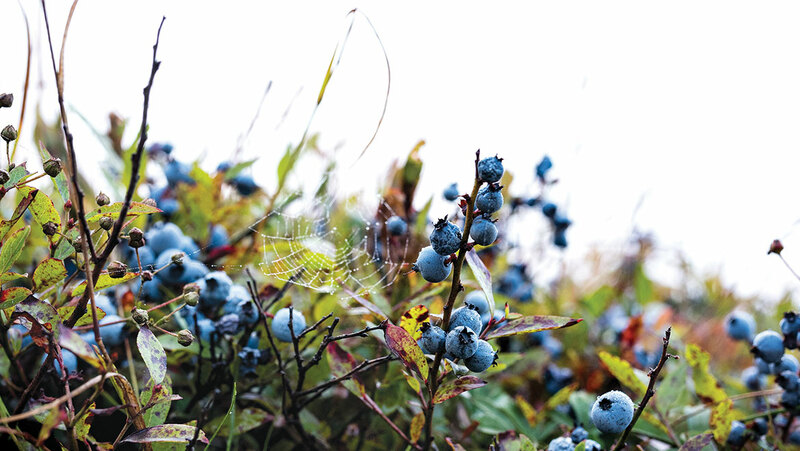 “We wanted land, and we wanted blueberry land,” Lydia said. “We wanted to be somewhat remote, to have space and the freedom to develop what we wanted to develop.” Their 260-acre farm is at the end of a dirt road; just at the moment you think that you must have overshot the place, a driveway curls up past the Beals’ 10 acres of blueberries to reach their barn and home. Last winter, the Beals extended ownership of the farm to their children—Nick, Jay, and Clara, who grew up in the blueberry fields. The packing building walls still bear faint blue smears where as kids they threw berries at each other. With help from Maine Farmland Trust, the Beals recently formed an LLC, the first step in making each child an equal business partner. Both of the boys are building houses on the farm, ensuring, like the Hanscoms, that the business will be in local family hands for at least one more generation of blueberry production. Additional reporting here by Laura McCandlish. and was featured on Food52.com last summer. 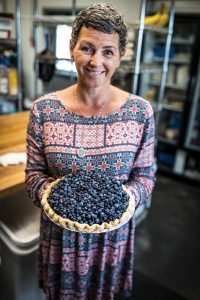 Helen’s owner Julie Barker, whose father processed blueberries on his Washington County farm, says this original recipe, handwritten and stenciled, is unchanged since Helen and Larry Mugnai opened the restaurant in 1950. 1. Make the blueberry gel. In a double boiler over medium-low heat, mix together the frozen blueberries, sugar, water and Let simmer until thickened. Remove from heat and let cool. 2. Mix together the flour, shortening, salt, and water for the pie dough just until fi Shape into a 9-inch pie pan and crimp the edges and chill it for at least 30 minutes. Preheat your oven to 325°F. Then, once you are ready to bake, dock or prick the chilled dough all over with a fork and bake it for 25 minutes or until golden brown around the edges. Let cool. 3. Combine the blueberries and cooled gel together in a large bowl and add the mixture to the pie crust. 4. Whip the whipping cream with the sugar and vanilla and then spread a thick layer all over the top of the blueberries. 5. Garnish the whipped topping with extra blueberries. Chill until solid and can be easily cut with a Cut into six generous pieces! This article is from the 2017 issue of our Maine Farms journal. Make sure to look through our archives. Two new videos to celebrate our 20th year! This year, we are celebrating 20 years of growing the future for farming in Maine! Throughout the year we’ll be releasing a series of six videos that illustrate our history, our work, and where we’re headed. So far, we’ve released two videos: one about our founding, and one about our work to protect farmland. Twenty years ago a small group of farmers and farm advocates started talking about this idea: that farmland, and farming, matter and should be protected. Soon, that little seed of an idea took root, and MFT began as the first and only land trust in Maine dedicated to protecting farmland and supporting farmers. Protecting Maine’s precious farmland is the only way to ensure that we’ll have the land we need to grow food in the future. 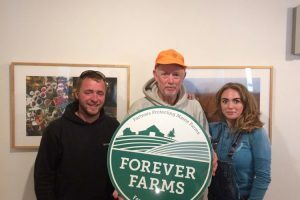 Several years ago, MFT worked with Bill and Darcy Winslow at High View Farm in Harrison to protect their farm, making sure that that land will continue to be available for farming for the next generation and beyond. High View is just one of the hundreds of farms MFT has helped to protect since 1999. Stay tuned for more videos coming soon! All of the videos were produced in partnership with the Knack Factory. Be sure to check out our 20th Anniversary website, where you can find events, a timeline of our milestones, and membership profiles. This June: Maine Farms Listening Tour! This June, we’re hitting the road to visit Maine farms! There’s no better way to celebrate our 20th Anniversary than with an epic road trip and listening tour that will bring us straight to the fields and barns of the farmers we serve. During this anniversary year, our staff and board are working on strategic planning and setting a course for the coming years. The listening tour will help us to dig into what is happening on the ground in Maine’s farming community and inform our work in the future. We want to focus primarily on rural parts of the state, visiting and talking to farmers and friends in their homes, at kitchen tables and in dooryards. We invite you to join us! Where should we go? Who should we visit? Want to host us? We want to hear from you! 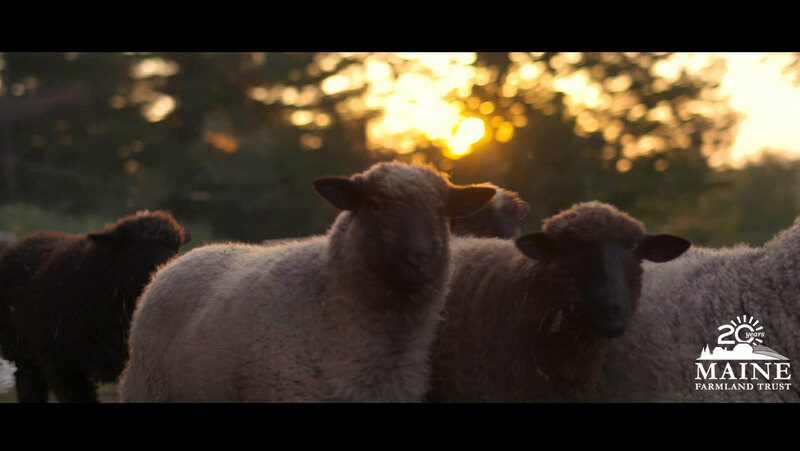 If you’re interested in connecting with us during the tour, send an email to ellen@mainefarmlandtrust.org or call us at 207-338-6575. 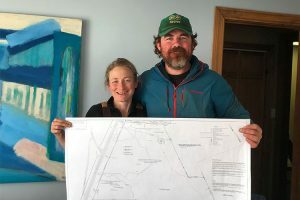 Philip and Heather Retberg of Quills End Farm in Penobscot have a lot in common with other young couples I’ve seen repopulate old farms: a clear commitment to good farming practices and good food, to improving their community, and through it, our planet. Yet different farmers take different paths. A decade ago, when I first met the Retbergs, they were doing something that was rare in those days: reclaiming former farm fields that had grown up in trees. Pioneers in more ways than one, the Retbergs were staking a claim on their future. It’s easy to forget the vastly different perception of farming’s future held by most Mainers—including many farmers—just a few years ago. When I began working with farmers in the mid 1990s, conventional wisdom held that farming in Maine was dying. The first statistics that hinted at farming’s potential re-birth appeared in the Federal Agricultural Census of 1997, with stronger signs evident in 2002. From 2002 to 2007, the number of farms in Maine increased by almost a thousand, from 7,199 to 8,136. By 2012, the value of farm production was up 24 percent over 2007, showing that new operations were not all small hobby farms, as some had suspected. Meanwhile, from 2007 to 2012, the number of beginning farmers jumped nearly 40 percent. Clearly, something positive was happening. Yet these statistics, as informative as they are, can’t capture the complexities undergirding farming’s renaissance. A deeper look at farm operations would reveal that some farms are thriving, while others are struggling, and many more only remain in business because the farmers are willing to work exceptionally hard for little money. While there is more to the issue, it is safe to say that farming in Maine is growing, if unevenly, and that public perception is more positive than it’s been in generations. There’s a newfound conviction that farming is here to stay. 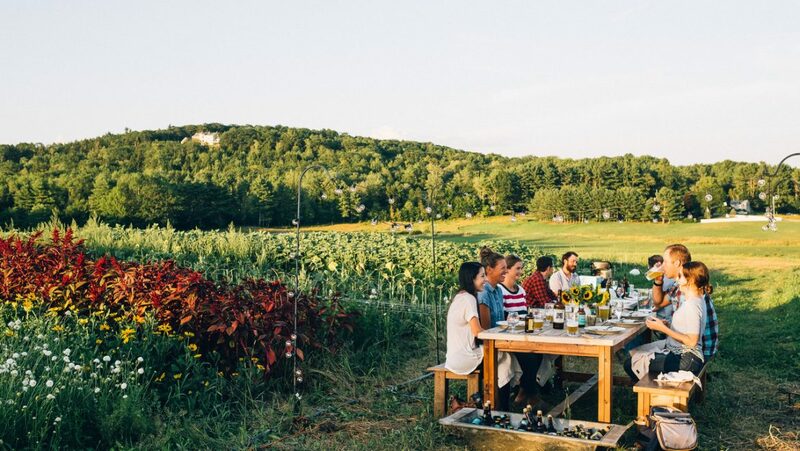 The idea that farming in Maine is poised to expand is nothing new, but it was thrust into the spotlight last spring with the release of A New England Food Vision. The widely-circulated study showed how New England could produce as much as two- thirds of its own food by the year 2060, but only if the region expands its agricultural production by 3-4 million acres. A good chunk of that land will need to come from Maine, simply because it isn’t available anywhere else in New England. But just because something could happen, doesn’t mean that it will—or that it will in a way that serves Maine well. As history shows, Maine farmers do not always benefit more from growing more. And clearing millions of acres of woodland for local food production could either help the environment or hurt it, depending on how it’s done. prevent farmers from making a decent living. Beyond this, we can’t think about expanding farming simply by returning overgrown woodland into farm fields. For one thing, we can’t afford to cut trees without paying attention to carbon emissions and water quality. For another, we can’t succeed at any of this unless we see the big picture—how fields and woods can each play a role in food production, and how any sustainable food system relies on the health of the broader ecosystem. Reclaiming former fields is clearly central to the future of farming in Maine. But we also need to move beyond our current thinking that fields are the only places where we can raise crops or livestock. Unlike a decade ago, today I know many farmers who are reclaiming former fields from woodland, and many more who are thinking of it. Farmland reclamation is driven by both current economics and future possibilities. returning woodland to agricultural production. 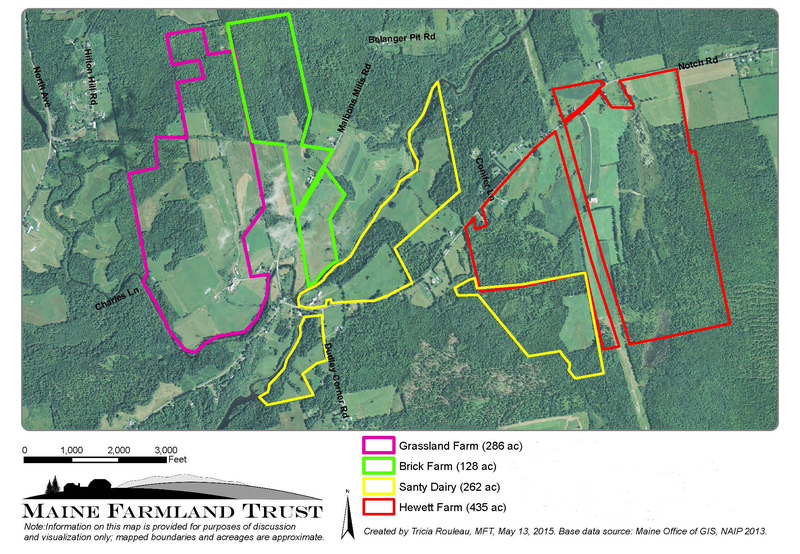 Meanwhile, the broader factor driving farmland reclamation is that Maine boasts millions of acres of once-farmed land that could be farmed again. In the 1880s, 6.5 million of Maine’s 20 million acres was cleared land used for farming—either for growing crops or grazing livestock. Today, only about 700,000 acres of land are used in this way. Of the remaining 5.8 million acres, some has been lost to development, but probably not much more than a million acres or so. Over 4.5 million acres of once-farmed land has reverted to woods—and very little of that land is part of Maine’s great northern forest, on which our paper mills rely. Here is a way that Maine could contribute millions of acres to the emerging vision that New England might someday grow most of its own food. Still, the goal should not be to simply transform millions of acres of woods into fields, but rather, to utilize that land for food production in new ways. There is a subtle yet important difference here, stemming from the fact that open fields are not the only way to grow food. Most of us acknowledge that woods are good places to collect maple sap and perhaps pick a few wild berries, but we seldom think of woods as a potential source of staple food products. And yet, many of the fruits and nuts we eat—though now harvested from orchards and fields—come from trees and woody shrubs with forest origins. Likewise, we may gather mushrooms or fiddleheads in the woods, but never think of raising traditional vegetable crops under a forest canopy. Yet many vegetables grow well in partial shade—including garlic, peas and greens. We could utilize our woodlands to grow more fruit and nuts, while cultivating vegetables in the understory. This concept of intermixing food-bearing trees with understory crops is the idea behind “forest farming.” Rooted in practices that stretch back centuries, forest farming was formally advanced in the 1930s, and more recently embraced by some of the advocates of permaculture. Though still rare in Maine, forest farming fits well with our soils and growing conditions. Woods can also feed livestock, which can thrive off the shoots of many trees, including poplar, locust, and beech. At one time in the South, mulberry was common fodder for pigs; while in Europe, pollarded willows were once customary winter feed for cattle. (In fact, the product was called “pollard hay.”) Slowly, greatly by using “management-intensive grazing,” in which animals are frequently rotated from one small area to another. This reduces runoff, while retaining nutrients and building soil carbon. It’s a smart practice, even if it does run counter to the romantic image of a farmer releasing sheep or cattle into a large pasture for the summer. Another common notion we need to move beyond is that a field, once cleared, should stay a field. Farmers have become accustomed to the idea of raising crops on a rotating cycle of, say, three years; but there is also value in thinking about far longer rotations of a hundred years or more, during which the very use of the land would change, not just the crops. During such a long period of time, a suitable woodland parcel may be either partially or fully cleared for livestock and/or crop production. (The decision of how much to clear would be driven by many factors, including soil qualities.) The parcel could then be managed to revert back to a wood, though perhaps one containing more fruit and nut trees than it had before. Perhaps 50 years in the future, this land could be cleared in some fashion again, starting the cycle anew. Such a system would bring with it some of the same kinds of benefits of short-term crop rotations, including reducing soil erosion and increasing organic matter, only on a whole different level. It could also serve to sequester large amounts of carbon, since neither land clearing nor farming, if done right, need result in net carbon emissions. In this light, the new wave of Maine land clearing that is now beginning could be viewed as the beginning of something much broader, and far more beneficial, than just creating new farm fields. Here is an opportunity to craft a dynamic and innovative system for sustainably producing more food. Maine should never have been farming 6.5 million acres in the 1880s—or at least not those particular 6.5 million acres in that manner. The landscape across much of southern and central Maine during that period was basically devoid of trees, except for orchards. 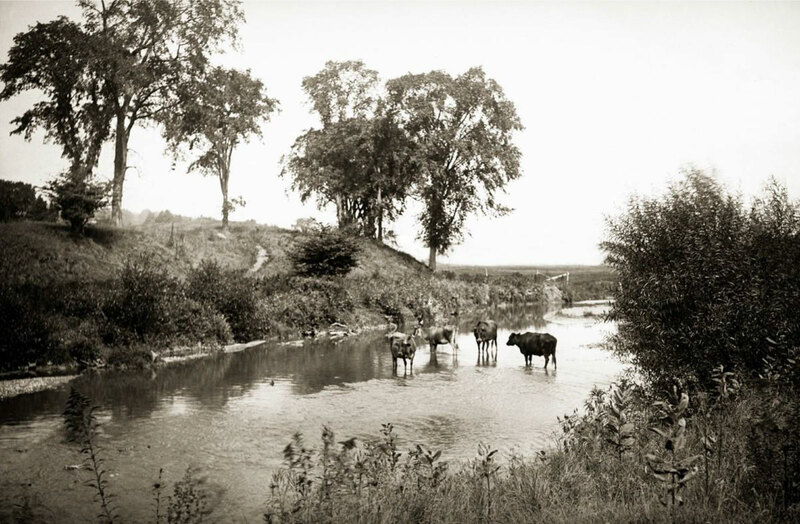 Land was often cleared right up to the banks of rivers and streams. 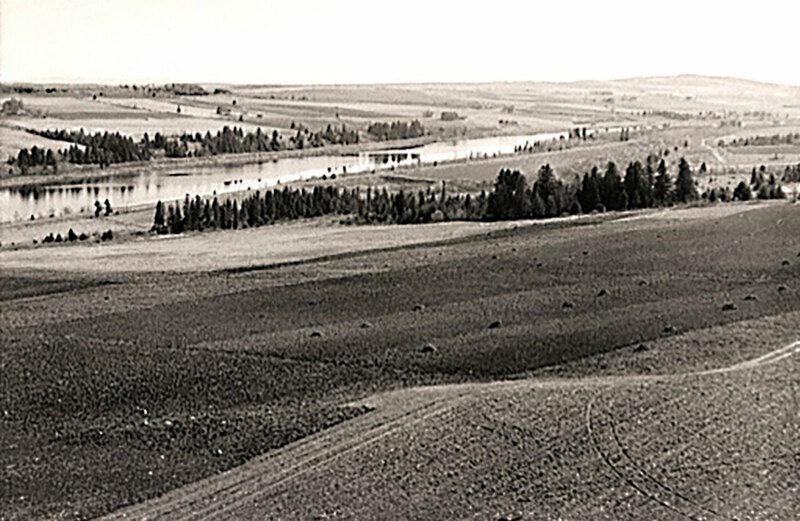 Pastures were often over-grazed and crops worked with little regard for soil conservation. As a result, we depleted our topsoil and despoiled our waterways. It’s a common story for our species: We push things beyond where they can be sustained, until the point where they collapse. But it doesn’t need to be this way. As Maine now moves to farm more, we need to learn from past mistakes. For instance, if we are to clear more land—whether fully or partially— it’s critical that we do so in ways that prevent soil erosion. Loss of topsoil not only constrains farming’s future, but results in the silting of brooks and streams, destroying spawning habitat for critical fish species. And if we are farming more, we need to be far more conscious of any fertilizers and pesticides we use, because their harmful residuals invariably end up in our waterways. One of many reasons to step up our game is that we can no longer ignore the impact of carbon emissions. It may seem that clearing woodland would result in a net increase in atmospheric carbon, but that need not be the case. Any wood that is suitable for lumber could be utilized in a way that ties up that carbon for 100 years or more. Some of the other wood could be converted into bio char, a soil amendment that sequesters carbon while increasing the fertility of the new field. And any remaining biomass could be used as heating fuel or to generate power, replacing fossil duel now used for those purposes. In addition, there’s a range of ways in which to clear land, each with a different carbon footprint. For instance, pigs can be pastured on partially cleared land as an alternative to using heavy equipment to remove roots. Beyond all this, any newly-created field could be farmed in a manner that sequesters more carbon than did the pre-existing woodland by utilizing no-till methods, aggressive cover cropping, and other regenerative practices. If we are smart about it, Maine could simultaneously advance local food production and environmental health, while also making strides to reduce carbon emissions. The strategy would involve clearing land—both fully and partially—in accordance with forward-looking environmental standards, and then pursuing production practices that wisely steward that land. Partially cleared parcels would become laboratories for forest farming and silvopasture. Fully cleared parcels would be farmed in ways that both produce high yields and sequester carbon. And wherever livestock are pastured, we’d see widespread use of management-intensive grazing. The whole system would be managed on a multi-generational rotation of 100 years or more. Of course, that is only part of what’s needed. Despite increased demand for local farm products, there is not yet sufficient demand to support significant increases in production at prices that work for farmers. For an assortment of reasons, often political, many of our farmers don’t make enough money to cover their true costs of production. To abridge my extensive writing on this topic. I’ll simply say that I’m confident that more economically viable markets will develop over time. But until that happens, the last thing that makes sense is for those farmers to grow more. Maine has the chance to do something truly significant, something that is powerful on its own and even more powerful because it could be a model for others. Maine can do far more than feed itself and help feed New England: Through our farmers, Maine can lead the way to restoring our planet. The farm itself is an ecosystem. Our crop is grass. Our harvesters are chickens and cattle and pigs and lambs and all the microbes and earthworms that live off what we do as we rotationally graze our animals. The entire ecosystem benefits… It increases the fertility of the soil, increases its ability to capture sunlight and do that incredible photosynthesis thing that feeds all life. Our job is to steward the land with the resources we are given: sunlight, water, earth, and photosynthesis. Our future lies in farms like this. *This is a focus of a PhD dissertation now being undertaken by Amanda Beal, a long-standing food systems advocate who serves as Maine Farmland Trust’s Policy and Research Fellow. This article is from the 2015 issue of our Maine Farms journal. Make sure to look through our archives. 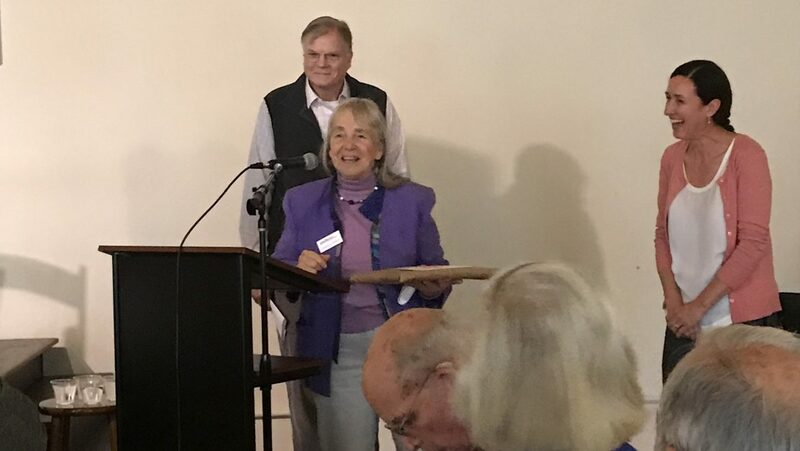 LouAnna Perkins received the Paul Birdsall Award at the MFT Annual Meeting, held on November 9, 2018. The award recognizes individuals who have made sustained and inspired contributions to Maine agriculture. LouAnna joined MFT in 2000 as the first, part-time Executive Director. Not long after she started, she closed her law firm in Bucksport devote all of her time to MFT’s work, bringing her legal assistant, Kristin Varnum (now MFT’s CFO) along with her. LouAnna shepherded the nascent organization through the critical first years of development, and laid the foundation for future growth. Today, LouAnna continues to help guide MFT’s work as our Senior Legal Counsel. Her contributions to MFT, and to Maine’s farming community, are deeply appreciated. The Paul Birdsall Award honors the commitment and spirit of its namesake, the late Paul Birdsall of Horsepower Farm in Penobscot. Paul was one of the founders of MFT, a longtime board member, and is considered to be the father of farmland protection in Maine. 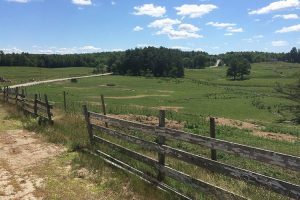 He recognized that Maine has a limited amount of farmland and saw the need to preserve the soil and the open land so that agriculture could thrive for generations to come. 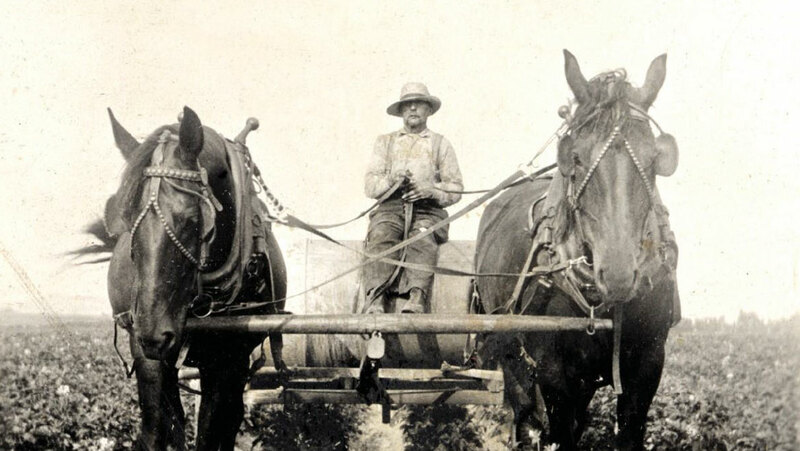 Paul was responsible for not only protecting acres of farmland, but also training farmers to work that land, and mentored over 100 apprentices on his farm. At a time when dairy farmers in Maine and across the country are facing numerous challenges affecting the milk market and resulting in low prices to producers, multiple Maine organizations have joined with Maine organic dairy farmers to investigate alternative market opportunities. A Local Foods & Farmers Market Promotion Program (LFPP) grant from the USDA was recently awarded to MFT, written in collaboration with the Maine Organic Milk Producers, Maine Organic Farmers & Gardeners Association, Coastal Enterprises, Inc., and the University of Maine Cooperative Extension, to execute a feasibility study to determine whether in-state processing could enable better market stability for organic dairy farmers. This successful proposal was also bolstered by support from the Maine Dairy Industry Association, Maine Department of Agriculture, Conservation and Forestry, Maine Farm Bureau, Wolfe’s Neck Center for Agriculture and the Environment, and the Congressional offices of Sen. Collins, Sen. King, Rep. Poliquin, and Rep. Pingree. Milk produced by the dairy sector represents Maine’s second most valuable agricultural product; sales value reached nearly $125 million in 2017. 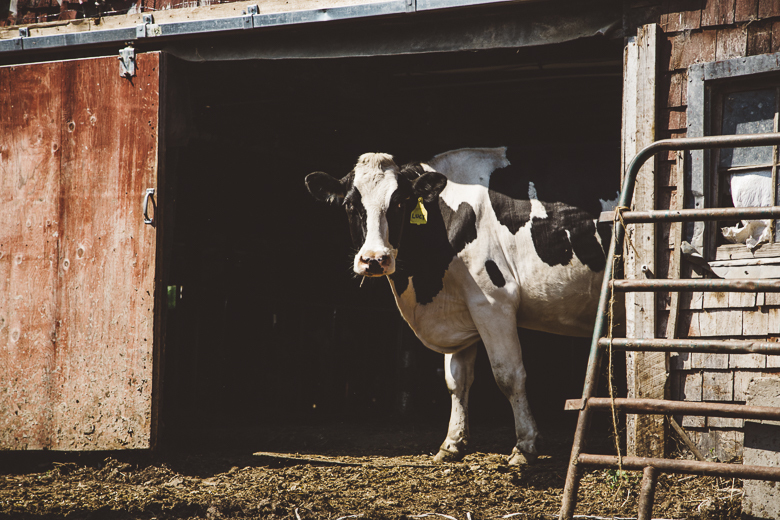 All of Maine’s dairy farmers face challenges due to existing political and market forces, which MFT and other partner organizations actively work to address on an ongoing basis through state and federal policy. However, certified organic farms, which account for nearly one-third of Maine’s dairy farms, face additional challenges as Maine lacks in-state processing infrastructure for their milk. While the organic market was once relatively resistant to the fluctuating price, supply, and sales of milk and milk products, this is no longer the case. Adding to the unease for organic producers is the fact that all bulk organic milk produced in Maine is shipped out of state for processing. This creates a dependence on processors operating in the national milk market, who can get milk elsewhere. This dynamic recently resulted in several organic farmers losing their contracts with an out-of-state processor. 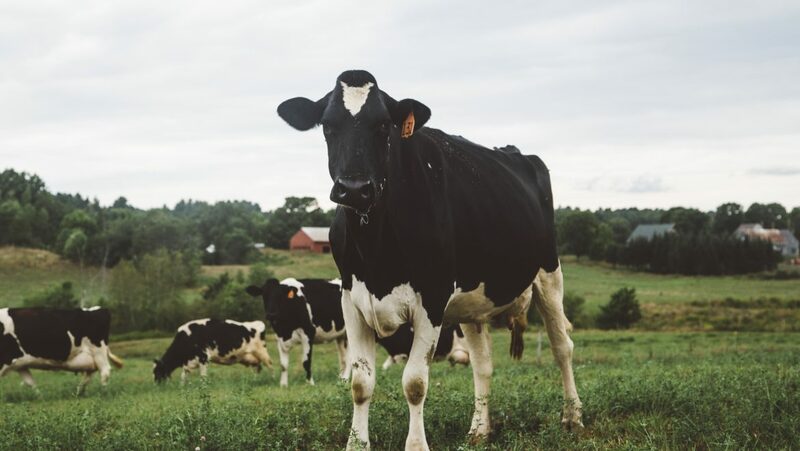 The feasibility study will examine the current needs of Maine organic dairy farms, estimate market-size for in-state processing infrastructure, evaluate various business models and run financial analysis to determine the viability of business models. The study will draw from the experience of MOOMilk, an in-state organic processor that closed in 2014. While many factors contributed to MOOMilk’s closing, the processor’s sales showed strong consumer support for a Maine organic dairy brand. Due to the urgency of the current dairy crisis, partnering organizations plan to finish the study within six to seven months, in hopes to inform some near-term action to expand in-state processing opportunities for our dairy farms. A core part of our mission is to protect farmland, and support farmers by helping them find and get on farmland. Every year we protect thousands of acres of farmland across the state. One recently completed protection project was in partnership with Andrew Ketch of Ketch Organics. Andrew and his wife Meeka own and operate a certified organic diversified vegetable farm in Woodland, up in Aroostook County. They run a popular farm stand and sell their produce at markets throughout the state, from Presque Isle to Portland. Andrew bought his original 76-acre farm from his grandfather, who was a potato farmer for years. Andrew and Meeka worked with MFT to purchase and protect a neighboring piece of farmland, and now Ketch Organics comprises over 204 acres, more than doubling the farm’s original size. With access to additional acreage, Andrew and Meeka can expand on their business’ success and continue growing good food for Maine. If you believe in protecting farmland for farmers, we hope you’ll consider joining us in this work. We can’t do it without you, pitch in!